I love it when I’m sent reprints of old books to review. It gives me the opportunity to hold history in my hands. What are the odds that in my lifetime I would hold in my hands a copy of the 1932 book “The Art of True Healing: The Unlimited Power of Prayer and Visualization” by Israel Regardie? Let’s be generous and say, not good. Thankfully, over forty years ago New World Library co-founder and Publisher Marc Allen found that book in a store and kept it in good stead so that it could be shared now. I’m not sure if Allen is as big a fan of Israel Regardie as I am, but it is obvious in his role as Editor that he does hold “The Art of True Healing” in high regard. And why not? The book’s primary focus is to instruct the reader in how to do The Middle Pillar Meditation. Readers of Regardie and/or the Western occult traditions are probably familiar with this exercise. For those of you unfamiliar with it, The Middle Pillar is an exercise where you work with moving energies throughout your body. I don’t want get too specific, it would be like giving away the book! Believe it or not, I have been known to bust out The Middle Pillar. However I didn’t grasp it’s true potential as a tool for healing until reading this book. I certainly never considered it as a magical working you could perform on another person, but there it is, written in clear, concise language. And as always when I read Regardie I’m now inspired to retake up a regular practice. Allen chimes in at the end with some variant versions he’s come up with over his years of practice. I highly recommend “The Art of True Healing”. It’s a wonderful introduction to Israel Regardie and a practical one at that. It has the pleasing introductory suggested price point of $12.95 and is in the perfect size for carrying in purse or coat pocket while studying. I’d also like to mention that obviously fans of Regardie, like myself, will want this book, but all my readers who work with energy for healing are going to want this book. Trust me. 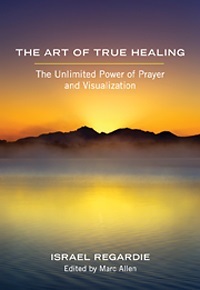 “The Art of True Healing” gave me new insights into subject matter I thought I already knew. That’s one of the best things I can think to say about this book.